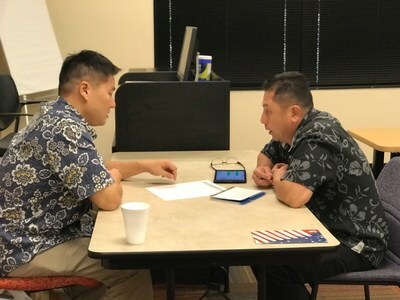 HONOLULU, Jan. 24, 2019 /PRNewswire/ -- Veterans met with Bank of Hawaii in Kapolei to practice their employment-seeking skills and to learn about job opportunities available to them through Wounded Warrior Project® (WWP) career counseling services. The event, organized through WWP's Warriors to Work®, brought together warriors, family members, and recruiters. They received information on current job openings; learned how to tailor their specific military experience to match banking industry job requirements; and performed one-on-one mock interviews for personalized feedback. "The more events like this I attend, the more confident I feel," said Navy veteran Anthony Amadeo. "The amount of information available is invaluable and makes a difference in how I approach my job search." Warriors mentioned how helpful it was to have feedback from industry professionals about how they currently perform during job interviews and where they can improve. "Sitting down with a recruiter to discuss how I did during a mock interview is extremely valuable," said Anthony. "Gaining experience increases confidence, which is important when walking into a live job interview." "These men and women have given so much for our country, and Bank of Hawaii supports their efforts to find a fulfilling civilian career," said Scott Miyaki, corporate recruiter, Bank of Hawaii. "I will do anything I can do to help them with their transitions." In fiscal year 2018, Warriors to Work program efforts helped place more than 2,300 injured veterans and family members in careers. The combined salaries and benefits of those hired warriors and family members exceeded $100 million. Help connect more wounded veterans with local companies seeking qualified job applicants at https://wwp.news/Donate.